The Department of Play (DoP) is a working group of researchers, developers, and community practitioners at the MIT Center for Future Civic Media (C4FCM) bonded by a common value: the design of new technologies and methodologies to support youth as active participants in their local urban neighborhoods. We might glance at the teen sitting next to us on the bus with a smart-phone and think: “Wow, the digital divide is shrinking.” My first thought goes to all the youth who don’t have access to mobile phones, who also have things to say. 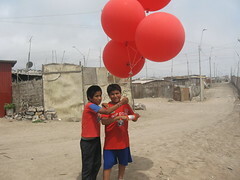 But I do see the divide diminishing when I see the wide smile of a Peruvian youth playing around with a big red balloon with a makeshift camera rig he made himself, to make his own map of his favela neighborhood. While higher broadband speeds and affordability recommended by the FCC’s recent national broadband plan should increase access to internet tools in under-served communities, we still need to consider the increased digital literacy and local facilitation necessary to use fully tap the power of these tools. While access is important, much more is needed to make sure technology can be used to empower young people. When the printing press made information more abundant, was the power in buying a book or also in writing one? Or in tools and media that make the ideas in books available to those who can’t read? In the world of Web 2.0, power is not just those who can read blogs, watch YouTube videos, or reference Wikipedia – it’s in the opportunity and motivation to produce, recommend, and create communities around digital content. Although some existing technologies can be used to foster youth participation and create locally relevant contexts for civic engagement, most tools are too complex at first or lack the functionality appropriate for youth-led endeavors. At the Department of Play, we not only advocate for a child’s right to “leisure, play and culture” (see article 31 of UNICEF’s Convention on the Rights of the Child) in child-friendly cities, but we also want to tap into the unique energy that comes from play. We aim to mobilize this grassroots ingenuity and innovation towards the development of healthy, creative and engaged citizens that actively contribute to the development of democratic societies. Building on the creativity of the MIT Media Lab and C4FCM, the DoP is working to remix the definition of a technology and the roles of inventor, user, and authority. The first step is networking MIT students and researchers with real-world practitioners to try a collaborative product development cycle, for low- and high-tech tools like home-made weather balloons/kites to capture your own aerial base-maps, software to stitch and annotate digital and hand drawn maps, and open source voice-over-IP solutions to use phone voicemail for youth event organizing. These tools will be the first components of a neighborhood explorers’ toolkit that offers youth, and the adults that mentor them, usable tools to: (1) capture neighborhood knowledge, (2) represent and share local information as spatial narratives, using maps and digital stories, and (3) reflect upon and act critically in their local communities. My favorite part of the DoP’s new community are the new mechanisms of engagement evolving in our monthly Boston-based community working group. The room is an awesome mix of MIT “geeks,” government agencies, community activists, and youth development practitioners who are all equally jazzed about putting technology into the hands of youth themselves. This month we borrowed the open mic-model and reflected together on the opportunities and challenges that new internet and media technologies offer in the Boston neighborhood context. 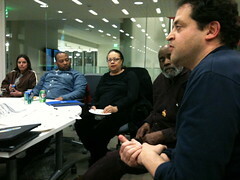 The goal is to form some garage tinkering interest groups that will try out some technologies this spring and summer, to give local youth new tools to document neighborhood assets and visualize their dreams. So, tag, you’re it. Now run by by our new wiki at http://departmentofplay.org or skip to the next meeting to learn more and join in the play.